Q: There are many so-called healthful packaged snacks for children on the market. Which snacks should dietitians recommend parents buy for their children? A: According to the USDA, in the past year, food categories with the largest share of overall new product introductions included snacks, only second to beverages. In 2016, 14.8% and 18.5% of all new products introduced were snacks and beverages, respectively.1 With the rapidly evolving snack market, nutrition professionals must stay abreast of new snacks being offered, especially when it comes to feeding kids. Although snack manufacturers may use claims like "low-fat," "non-GMO," and "natural" on food products, this doesn't necessarily mean the snacks are nutrient-dense or appropriate for children. 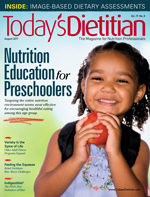 Nutrition professionals must remind parents that snacks should include nutrients that children need for proper growth and development, with a focus on nutrients of concern including vitamin D, fiber, calcium, and potassium. Nutrition professionals should educate clients on label reading and develop a list of kid-friendly snacks sold in nearby supermarkets or online. 1. Bare Snacks Chia Coconut Bites: Chia and flax, chia and pineapple, and chia and vanilla are combined with coconut to make these bites. They provide between 180 and 190 kcal per 1/2-cup serving. They're a good source of fiber and provide small amounts of iron and calcium (www.baresnacks.com). 2. Annie's Popcorn: Available in Butter & Sea Salt and White Cheddar flavors, a 2 1/2-cup portion of this popcorn provides 170 kcal, 8 g whole grains, and 2 g fiber (www.annies.com). 3. KIND Fruit Bites: Made with 100% fruit and no added sugar, these fruit bites come in Cherry Apple, Strawberry Cherry Apple, and Mango Pineapple Apple. The only ingredients are the two or three fruit names in the product title (www.kindsnacks.com/products/fruit-bites). 4. Saffron Road Crunchy Chickpeas: Add pulses to your child's snacking repertoire. Flavor offerings include Sea Salt, Korean BBQ, and Falafel. One-quarter cup of the Sea Salt variety contains 130 kcal and 5 g fiber and is saturated fat-free. Biena Foods is another chickpea snack that has expanded its offerings (http://saffronroadfood.com/crunchy-chickpeas; https://bienafoods.com). 5. Brothers All Natural Fruit Crisps: Freeze-dried fruit contributes to daily recommended fruit servings. Each snack pack has Disney characters on the front; flavors include Apple Cinnamon, Banana, Fuji Apple, and Strawberry-Banana. These vegan and allergen-friendly snacks are made without gluten, soy, peanuts, and tree nuts (www.brothersallnatural.com). 6. Rhythm Beet Chips: Made from beets and sunflower oil, these beet chips are an excellent source of fiber and a good source of potassium. They also contain lesser amounts of iron and calcium. Flavors include Naked (or plain) and Sea Salt (http://rhythmsuperfoods.com/beets-sea-salt). 7. Zespri SunGold Kiwis: This kiwi variety is hairless with a yellow juicy flesh and a sweet tropical taste, similar to a cross between a mango and a strawberry. Two kiwifruit provide 110 kcal, 2 g fiber, 2 g protein, and 20 g sugar. They're an excellent source of vitamin C and a good source of potassium and vitamin E. They're available nationwide (www.zesprikiwi.com). 8. RXBAR Kids: These protein bars are made with egg whites, almonds, cashews, and dates, and come in Berry Blast, Chocolate Chip, and Apple Cinnamon Raisin flavors. They contain 210 kcal, 12 g protein, and 5 g fiber (www.rxbar.com). 9. Justin's Snack Packs: The snack packs have expanded their offerings. Choose from pretzels or banana chips dipped in nut butters like almond, hazelnut, or peanut butter (some plain and some with flavors such as maple or chocolate) (http://shop.justins.com/Snack-Packs/c/Justins@SnackPacks). 1. New products. US Department of Agriculture, Economic Research Service website. https://www.ers.usda.gov/topics/food-markets-prices/processing-marketing/new-products. Updated April 5, 2017. Accessed June 15, 2017.